In spite of the whole obsession with youth, it is great to have already entered the age of wisdom. My kids have posters and stories about Formula E, Tesla S and Le Mans racecars with hybrid systems. This forces me to go into the garage and reminisce. I am really glad that I was able to experience the Group B and the real Formula 1 era with heroes like Alain Prost, Nigel Mansell, Nelson Piquet, Stefan Johansson, and Ayrton Senna as a boy. 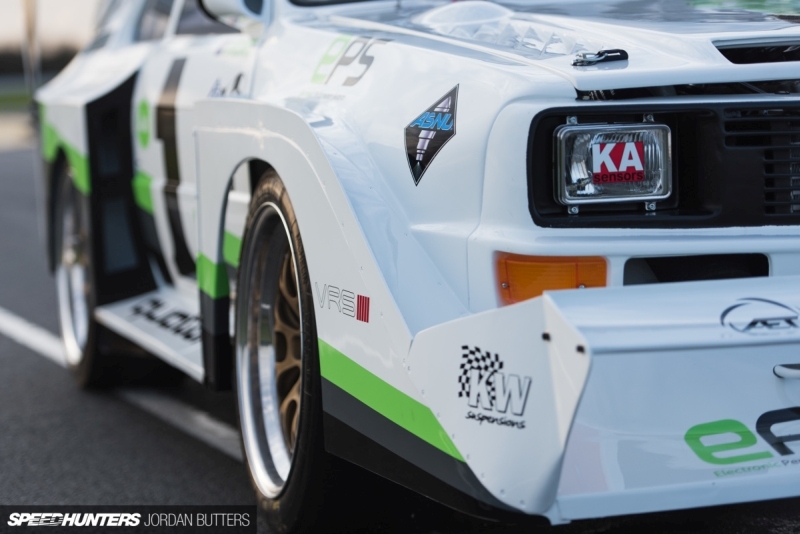 For years, when I was a kid, there were posters of Audi Sport Quattro S1, Lancia Delta S4, Mazda RX-7 GSL and Peugeot 205 T16 that hung in my room. 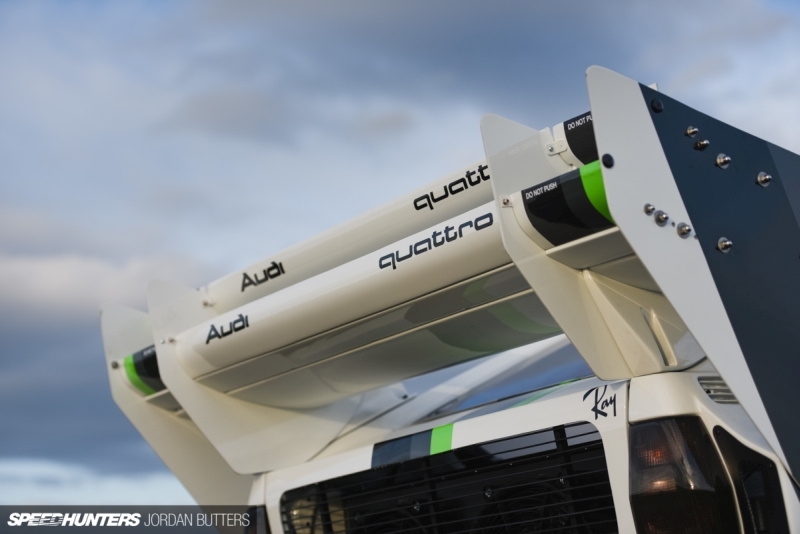 Before the Group B monsters disappeared from the international rally stage, they left with a big fuss and Audi had the biggest and most spectacular stage. PPIHC is the Pikes Peak International Hill Climb and the Australian who lives in Great Britain kept his word. 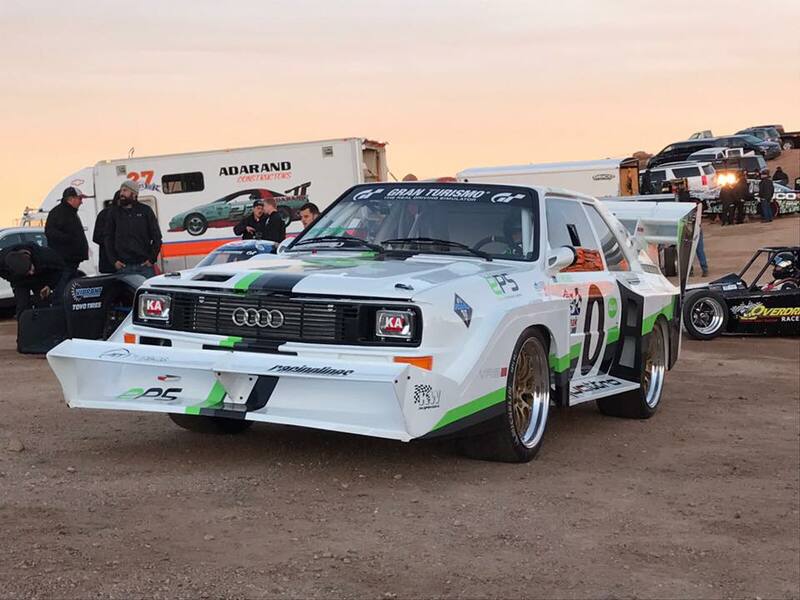 It is the 30th anniversary of Walter Röhrl´s legendary Pikes Peak Adventure in 2017 and it is just awesome that somebody has started with an S1 in Colorado! To be honest, during the first practices at the end of June 2017 there were some slip-ups, but Dave was confident about the race on June 25th, 2017 and reached the top of the mountain! 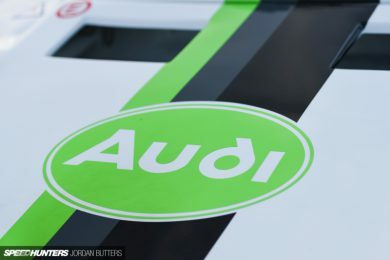 Finally I better dedicate some time to the Audi, thanks to my friend and #Speedhunter Dino I got Jordan Butters unbelievable cool pictures of the S1 test and adjustment drives. Arigatou Gozaimasu, Dino-san. 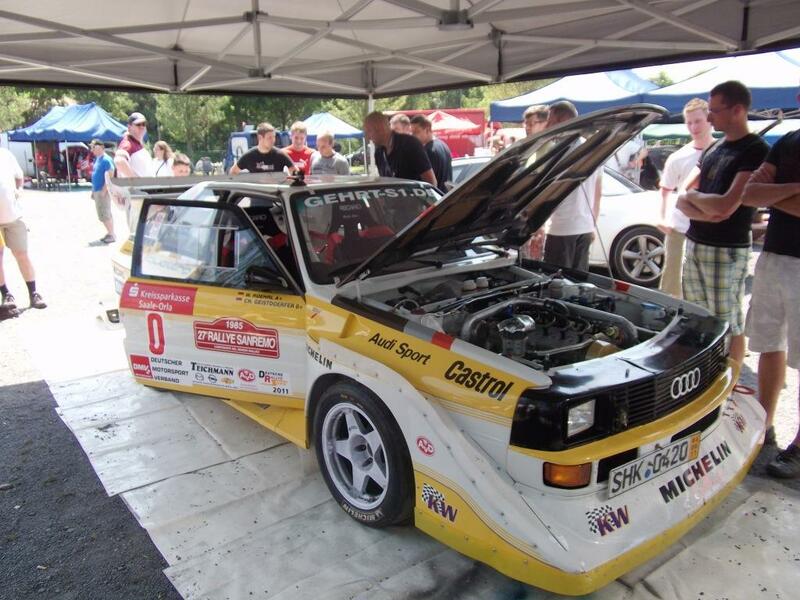 This Audi isn’t Dave´s first new rebuilt S1. 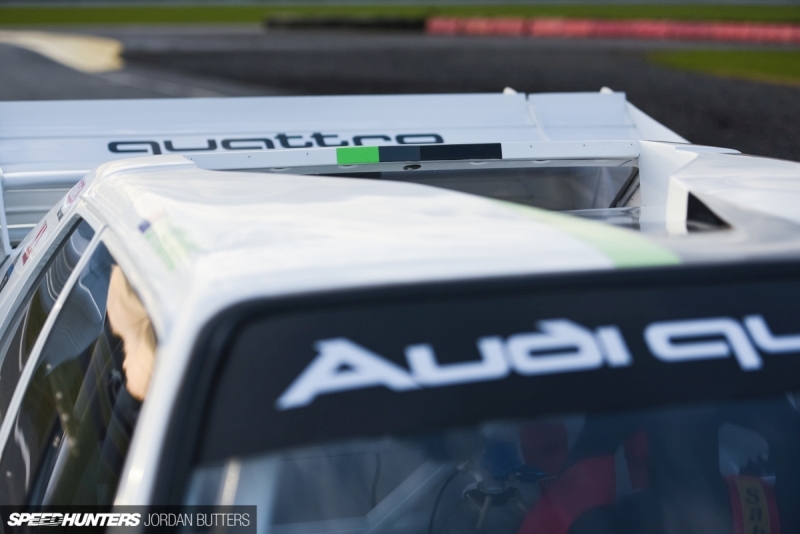 “Once I had something crazy with a V8 engine; but this time I rather follow the true, pure Quattro character.” To make sure that the Car at the “Race to the Clouds” still remains competitive, the S1 is equipped with modern hardware. Dave started with the S1 basically just like the Audi motor sport department did in the eighties. At first, he picked a two-door Audi 80 and an Audi Coupé into single parts and cut the blank car bodies into half. While the coupé front window has an inclination of 59.5 degrees, the sedan front window has an incline of 62 degrees and the difference of these few degrees has helped the sun be less blinding when driving. 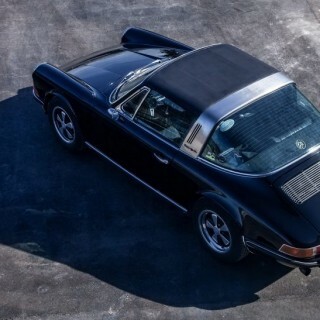 Afterward, Dave shortened the coupé body by 32 cm, put both bodies over a specially constructed T45 roll cage from “Custom Cages” and welded the coupé rear and the front half of the Sedan together. The style of the Group B set the notes for the bodykit. Weight was saved by the immense use of aerodynamic and body parts made of carbon-Kevlar fabric. All windows are made of light polycarbonate and there are little slide openings in the windows that are in the doors. 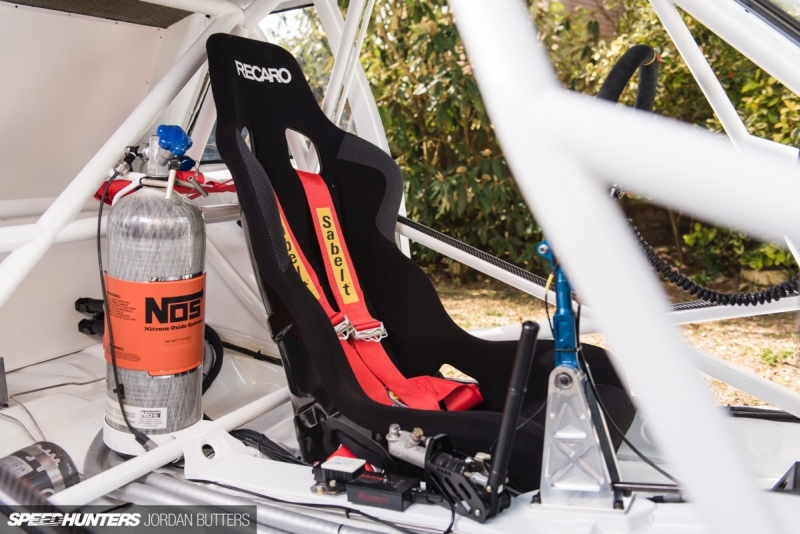 The Kevlar-carbon doors are mounted with hinges featuring a quick-release fastener so that it can be taken off quickly for maintenance work in the interior. An orthodontist talks about an “underbite”, but every petrol head including me will just think about the ”DOWNFORCE“. The far forward front wing ensures the necessary aero force on the front axle. The apparently slightly oversized rear wing is completely adjustable in order to lead the air flow over the rear and therefore to be able to purposefully change the setting of the downforce. Taking a look on the roof also proves that there is really knowledge and engineering in the new built S1E2. The big air intake leads the streamed air directly into the heat exchanger of the cooling circuit in the rear. Dave was obviously thinking about everything when he built it, as he even linked the water pump with the engine control. Two Kenlowe fans additionally support the cooler and blow the warm air to the outside. 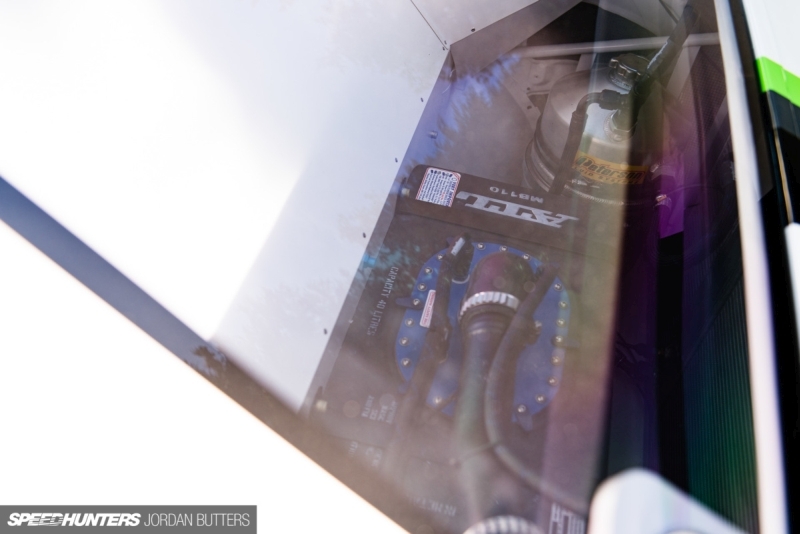 When you take a look through the polycarbonate rear window, you will recognize a catch tank in front of the recuperator, a pretty small race tank with a volume of 40 liters. This is also where the tank of Peterson Fluid Systems dry sump lubrication is located. 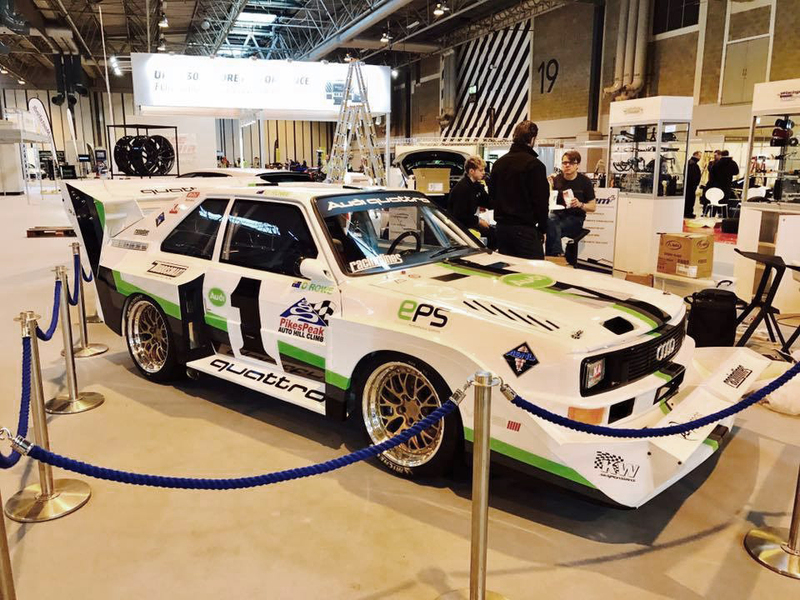 The complete graphics and decals are of course a tribute to the Quattro, which Walter Röhrl drove back then to win the Pikes Peak; only they are kept in the colors of Dave´s company EPS Motorsport. 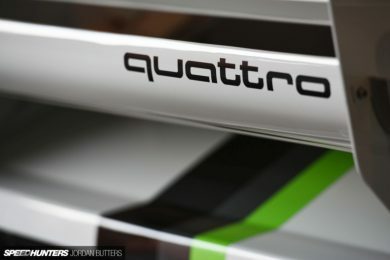 After looking at the side at Dave´s Quattro it is apparent how short the wheelbase actually is. It is only 2.18 m, which is even less than at a current Fiat 500! 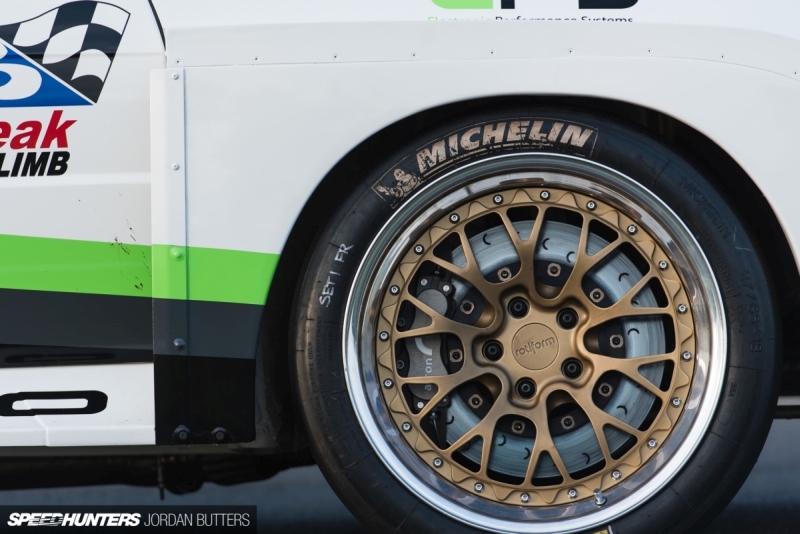 The mounted wheels during test and adjustment drives will actually cause controversy one way or another, but according to Dave, Rotiform has manufactured three-part forged wheels in 10.5 x 18 inch all around, conforming to his specifications. 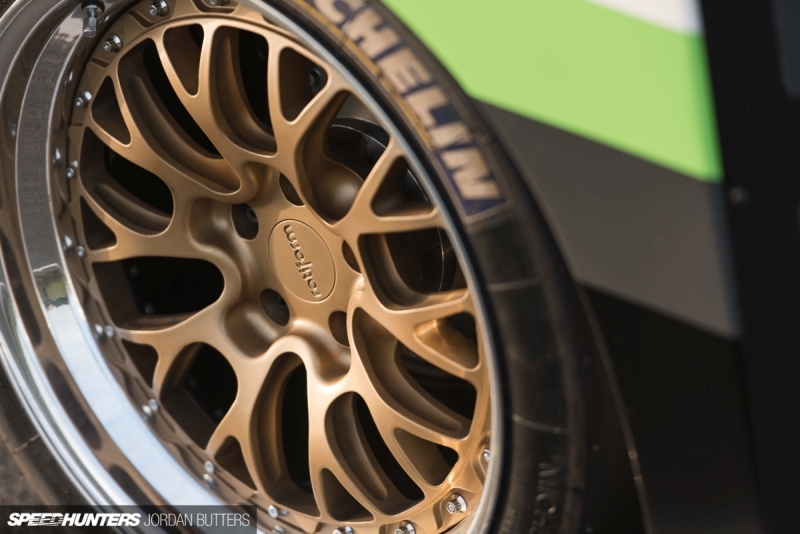 For the brakes, Dave uses Alcon GT six-piston and four-piston calipers with 380 mm and 355 mm discs including Bosch Motorsport anti-lock braking system. “With my weight of 1.000 kg, it brakes pretty well”, Dave laughs. As I have already said at the beginning, I am always happy when a Sport Quattro as our guest on the 7post rig here in Fichtenberg. In this Audi, of course, is also featured a KW competition suspension kit. Just like in so many other race cars. In this case, it is a KW 3-way Competition racing suspension inverted mono-tube KW dampers and reservoirs. The rebound is adjusted below at the purple adjustment wheel. The valves are located for low speed and high-speed compression damping in the reservoirs that are connected via steel flex pipes. 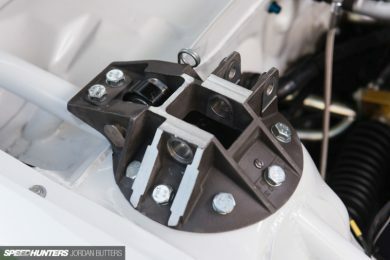 At Audi Works in the northern English Blackpool, Dave ordered top mounts with a quick release fastener in order to be able to quickly change the steering axis inclination. 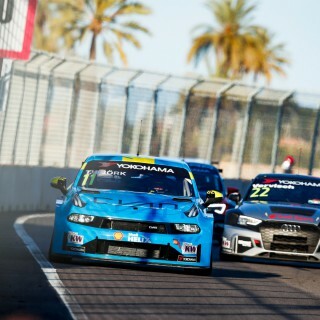 They have already used this back then in the original S1E2, to quickly switch between the setups for gravel or asphalt. 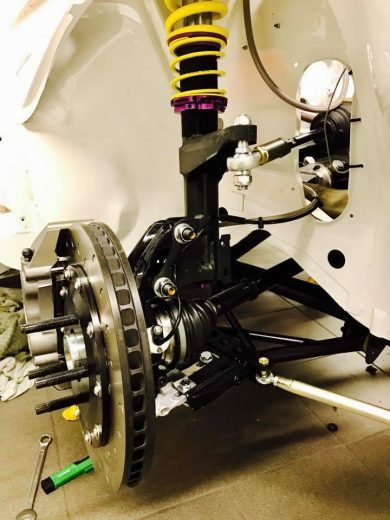 All the customized track rods and anti-sway bars are from Audi Works. 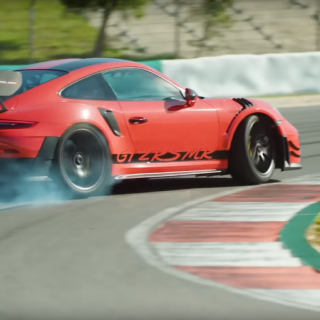 If you would like to know how we actually build our racing and special construction suspensions, you can watch our colleagues from the competition department in a three-piece YouTube video. Unfortunately, everything is in German. 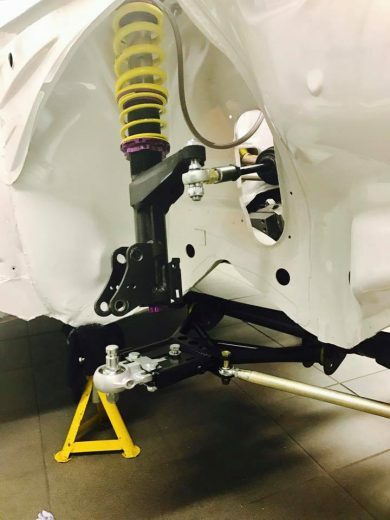 In the spring, Sidney Hoffmann visited my colleagues in the competition department to more or less build his own racing suspension for his second RWB Porsche. But let´s get back to Dave´s Audi. 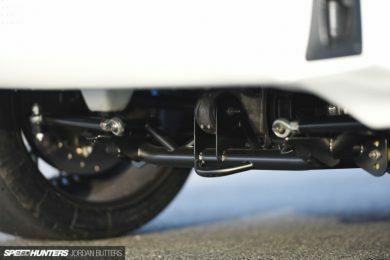 The braking system and the KW suspension are not the only modern hardware. 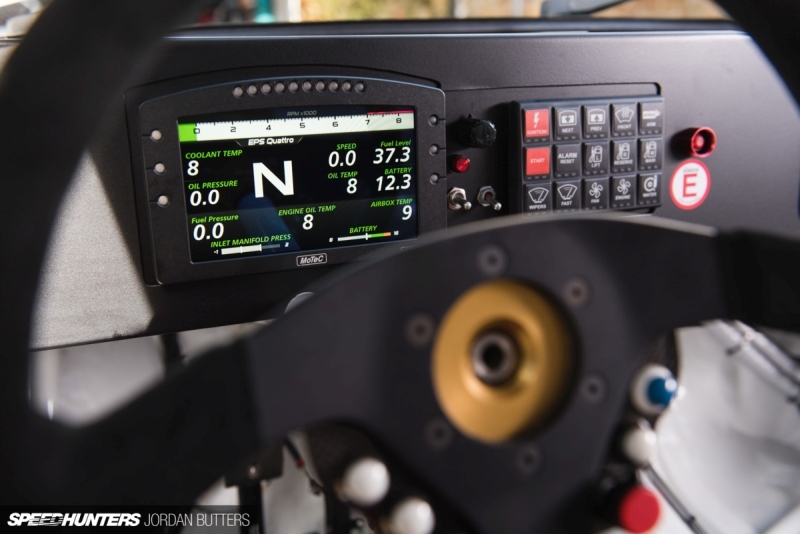 When Dave starts his Audi S1, the MoTec Display also awakes and gives all of the information. But something else is happening; the five-cylinder presents itself acoustically, but it is not the sound of the original 2.1-liter-engine. 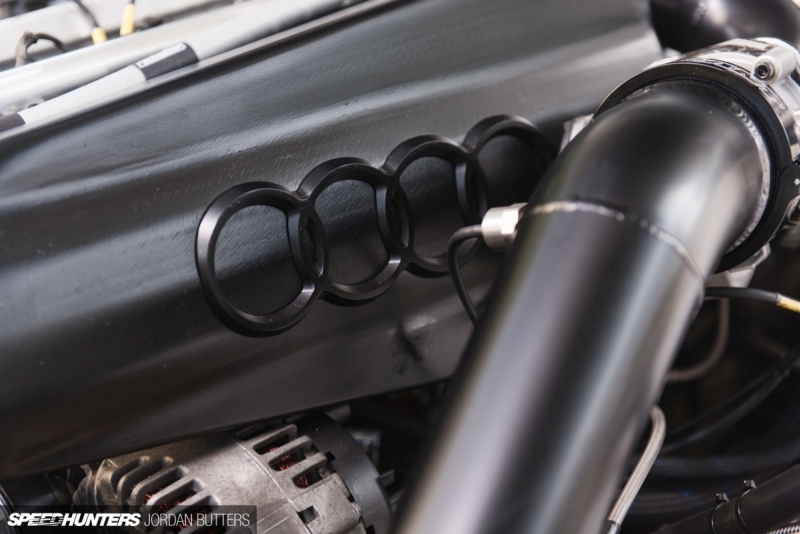 The modern five-cylinder under the Kevlar hood is the 2.5 liter (Motorcode 07K) from the Audi TT RS. 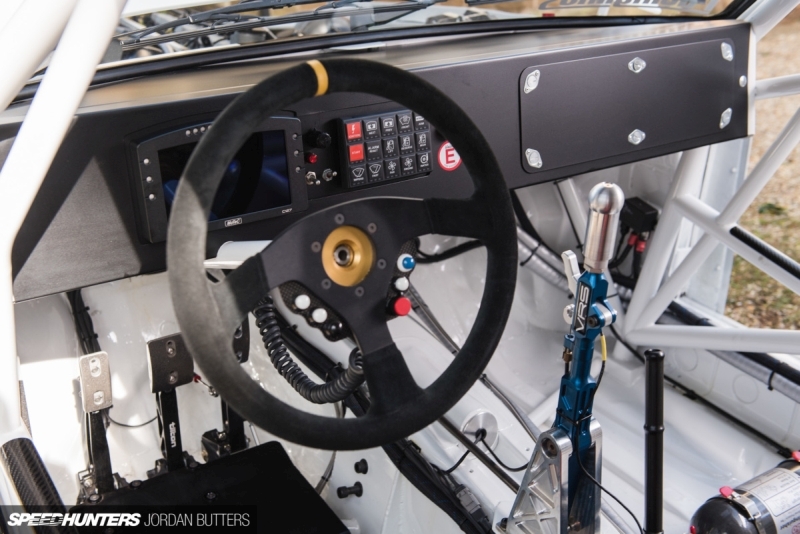 The complete interior of the 20V is trimmed with “Motor sport” components. 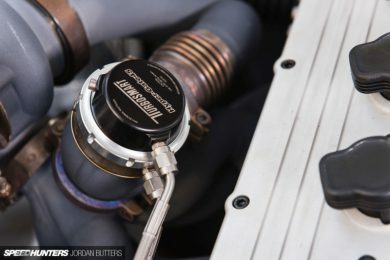 But forged pistons from CP-Carrillo, connecting rods, different camshafts, adjustable camshaft wheels, valves and a changed condensation (11,0:1) were just the beginning. 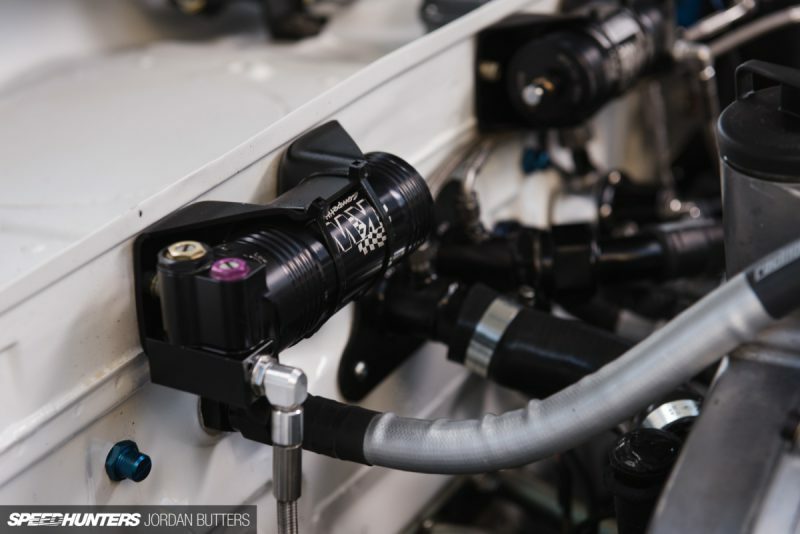 The complete air charge circulation is worth several glances, as well as the self-built intake with 82 mm electronically controlled throttle valve. 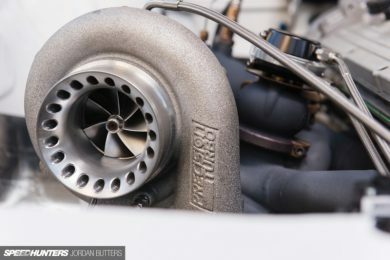 A 6466 turbo from Precision Turbo is responsible for the charge pressure, which is kept in rein in combination with a Hyper-Gate45 wastegate and boost controller from Turbosmart. Hardware, which one would like to have in his or her own car. The complete tubes are ceramic coated and hose clamps from Vibrant Performance keep the boost in its place. 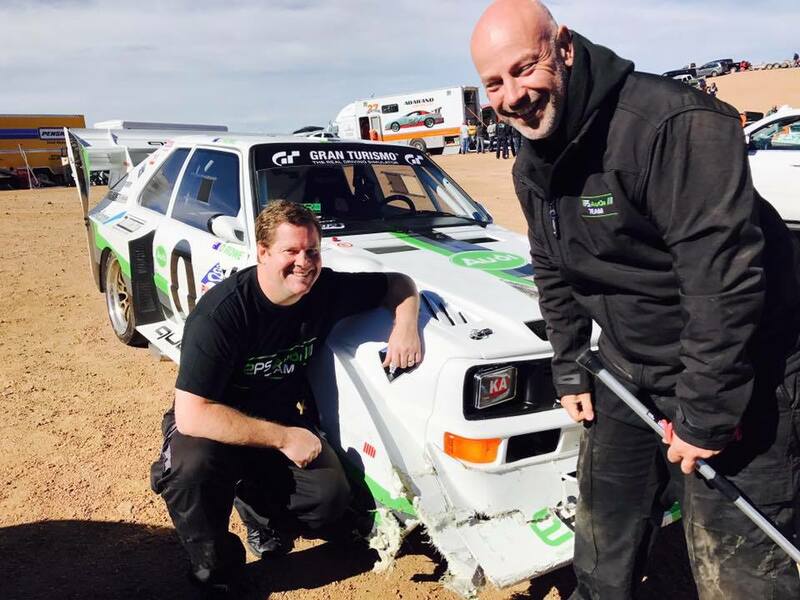 Dave earns his money with his company EPS motorsport not making restorations of old classics, but his daily business is motor tuning and adapting the software. 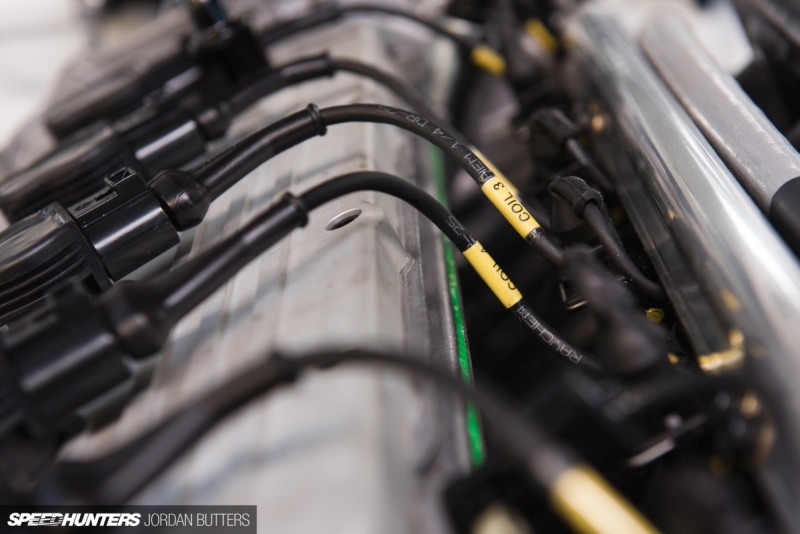 For this reason, you might better understand the complete detail loving with the labeled pipes and wires. 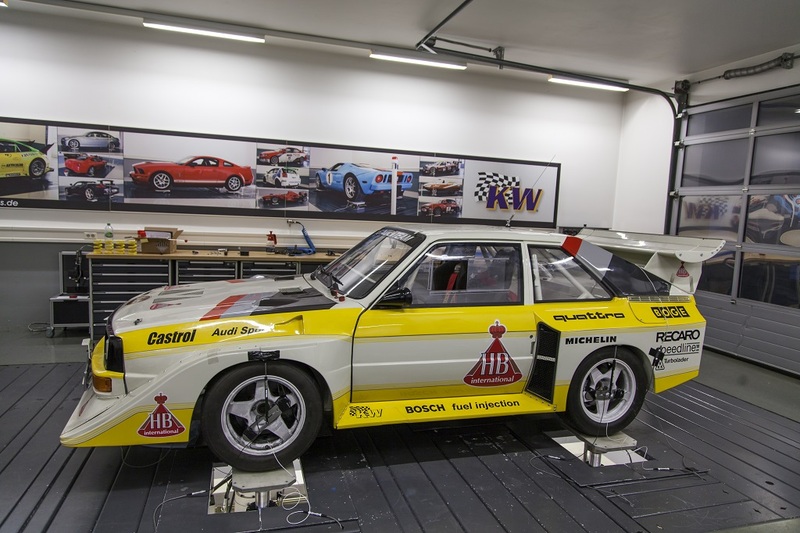 Compared to the original “Pikes Peak S1”, in this rebuild many sensors (complete sensors from KA Sensors) are installed for data analysis, not even the Audi motorsport engineers in the mid-eighties would even dare to dream about. 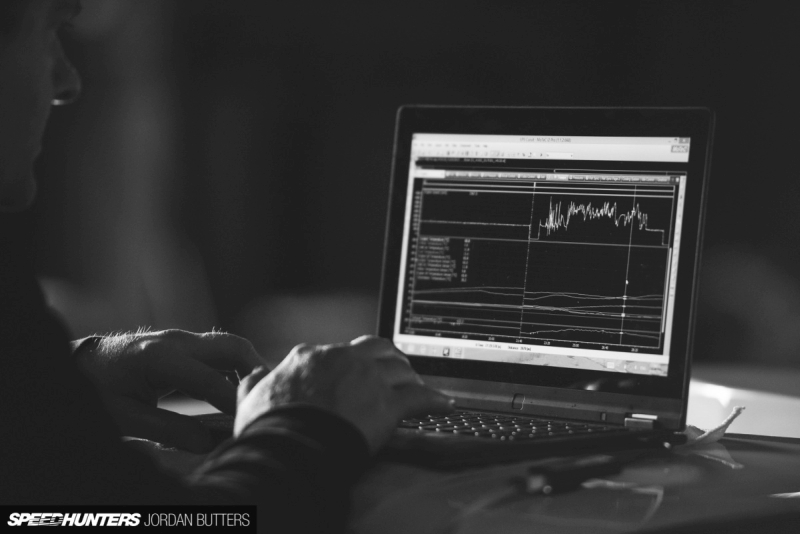 Even the revs of the turbo can be analyzed and controlled. All data are controlled via the MoTeC M150 engine control. Depending on the setup, the performance of the five-cylinder is at stable 800 hp with immense reserves upwards, finally, the air is pretty rare at the Pikes Peak. It will be started at a height of 2.862 m above sea level and the finish is at 4.301 m – and compared to the whole electrified race cars, the good “old combustors” will lose from the start to the summit about one-third of their engine performance.